For oil painters who find themselves eager to paint but reluctant to spend too much time or money on surface preparation, you might try working on paper. Paper can be reasonably priced, easy to prepare and less formal than panel or stretched canvas. 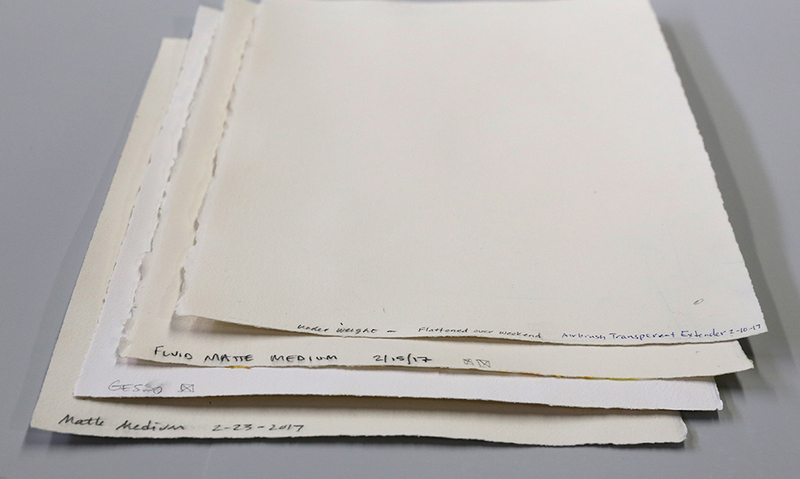 If prepared properly and maintained with longevity in mind, paper can be a permanent substrate for sketches, studies and finished oil paintings. 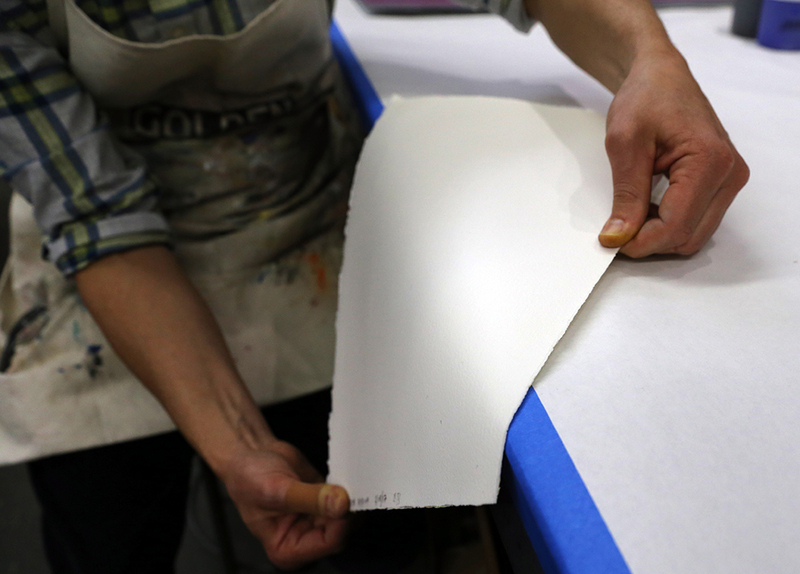 Paper, like other natural fiber substrates such as linen or canvas, needs to be sized or primed before oil painting. Sizing protects the fibers from oil absorption, which can cause premature darkening, embrittlement and eventual degradation of natural fibers. The challenge of sizing paper is keeping it from warping. We have recently tested various ways to size paper, looking for products that both protect from oil absorption and cause the least warping. For this test, we used untaped and unstretched Arches® 140-pound, hard sized watercolor paper and Arches® Oil Paper. Oil Paper is specially formulated for use with oil-based media and requires no preparation before use. Since it is already sized, additional layers of acrylic product, Acrylic Gesso or Oil Ground can be used to reduce tooth or brush drag, but are not required to protect against oil absorption. The acrylic products we tested on Oil Paper caused very minimal to no warping and we saw no signs of oil absorption. Of the product we tested on the 140-pound watercolor paper, Fluid Matte Medium, Acrylic Gesso, Airbrush Transparent Extender and Matte Medium caused the least amount of warping. These products resisted oil penetration with two or three coats. Image 2: Good results with several coats – Fluid Matte Medium, Acrylic Gesso, Matte Medium and Airbrush Transparent Extender on 140-pound watercolor paper. 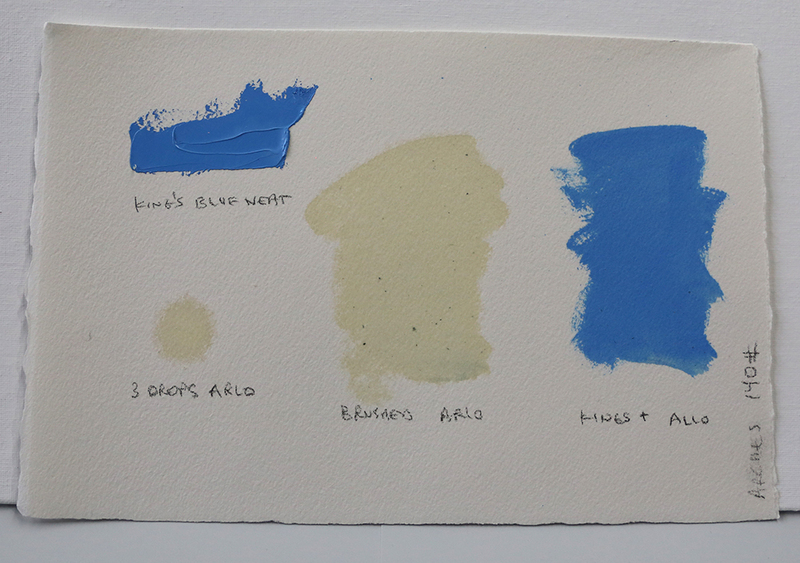 Images 3 & 4: Oil Absorption Test on unsized 140# watercolor paper: front side (Left) shows 3 drops of Alkali refined linseed oil, brushed oil, King’s Blue neat and King’s Blue thinned with oil, back side (Right) shows oil penetration. Similar tests performed on Oil Paper, Oil Paper with acrylic product and 140# watercolor paper with two or more coats of acrylic product showed no oil penetration. We recommend smoothing the paper as much as possible between coats so as to not reinforce the curling with additional layers of acrylic. We found that gently running the paper over a table edge to oppose the warping or pressing the paper left it relatively flat. The final layer of priming should ideally be matte for increased tooth and porosity. We recommend allowing at least three days for acrylic products to fully dry before painting on them with oils. There are pros and cons about working on paper. Some positives are that paper can be shipped flat or gently rolled around a tube and can be stored in a flat portfolio. For exhibition, works on paper can be adhered to panel or matted and framed under glass. 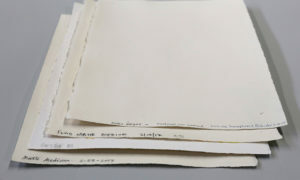 The negative for paper is that it is fragile and will expand and contract in response to changes in humidity. As oil paint becomes older and more rigid, this movement, as well as any flexing of the paper, can cause cracking. Paper can also tear and retain the memory of folds or creases. Heavy applications of oils are not recommended for paper without proper reinforcement. All substrates have their strengths and weaknesses and paper is no exception. In the end, paper is a good choice for those who are looking for an economical substrate that is relatively easy to prepare. Paper is great for landscape painting or studies done outside the studio. I have some oil paintings I have done on shellaced mat board. Do you suggest I frame them under glass or can I varnish them and not use glass. You certainly have options based on your preferred aesthetic. It is good to know that shellac is brittle and becomes more brittle and darkens with time. We tested BIN® pigmented shellac on 140 pound watercolor paper for this article and found the results to be much more brittle than the paper sized with acrylic product or PVA. The paper sized with BIN readily cracked when bent. Framing with a backing board could support the matboard and help protect it from damage caused by bending. Framing under glass could help keep dust from the surface and offer some UV protection depending on the glass, but can be heavy and expensive depending on the size of the painting. Varnishing can offer UV protection and unify the sheen of the painting, but won’t protect the matboard from embrittlement. Adhering the Bristol to a rigid support could help mitigate issues associated with embrittlement. I work with acrylics on paper. 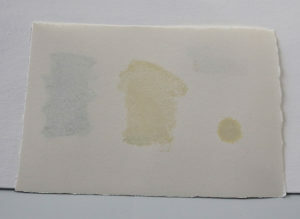 I gesso the paper and when dry it curls, so I then put the paper in a dry mount press and when I remove it, it is flat. An an alternate strategy, I simply mount the paper to 4 ply rag board. Thank you for sharing your successes with using the dry mount press to flatten your paper. We have not done testing with dry mount pressing. Our only reservations might be that gloss or thicker acrylic applications could flatten or distort under the pressure of the press. I regularly use 4-ply Strathmore Bristol Plate, primed with Bullseye shellac. There is no warping. What do you think about longevity of this approach? 4 ply Bristol Plate made with 100% cotton fiber should be fine, but shellac is brittle and becomes more brittle and darkens with time. We tested BIN® pigmented shellac on 140 pound watercolor paper for this article and found the results to be much more brittle than the paper sized with acrylic product or PVA. The paper sized with BIN readily cracked when bent. You may consider testing the 4 ply Bristol for embrittlement by coating it with the shellac and then bending it to see if it is more brittle than uncoated Bristol or Bristol coated with Acrylic Gesso. Adhering the Bristol to a rigid support could help mitigate issues associated with embrittlement. 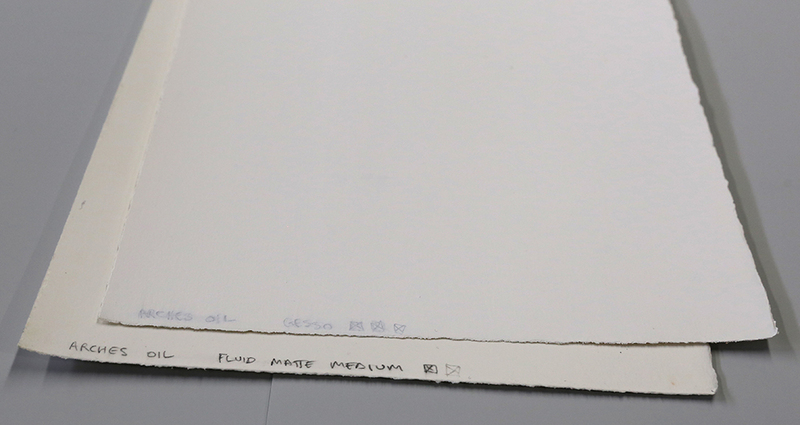 We have tested High Flow on Arches Oil Paper and haven’t seen any excessive beading or adhesion issues. After the paint dried on those tests, we peeled the paint from the surface and it removed the top layers of paper with it, so we have reason to believe there should be good adhesion between High Flow Acrylics and Oil Paper. We have also contacted Arches and asked if acrylics can be used on the Oil Paper, which they said should be fine. If you have other concerns or questions about adhesion of GOLDEN High Flow Acrylics, feel free to contact us at help@goldenpaints.com or at 800-959-6543. It’s like you were reading my mind the past few weeks! Thanks for the great article, Greg, can’t wait to try this out soon! Thanks for another very useful article! I’m wondering, if, say, one is planning to ultimately glue the paper to a rigid board (should the painting prove successful) if it would make sense to use GAC 200, rather than the mediums mentioned here, in order to stiffen the paper? Of course I’d have to do tests to ensure sufficient number of coats to block oil penetration etc but just wondering what your opinion is? We are not sure stiffening the paper would offer any benefit especially if you plan to adhere the paper to a rigid support. In general, we do not recommend using GAC 200 on a flexible support such as paper. Two coats of Fluid Matte Medium or Acrylic Gesso should be fine. They are more flexible than GAC 200 but should match the flexibility of the young oil film painted on top. I don’t see why you are reluctant to stretch the paper in the normal way by wetting and taping, you will have to use a drawing board to work on the paper, so you may as well have it securely taped down in the first place. Thank you for mentioning that. 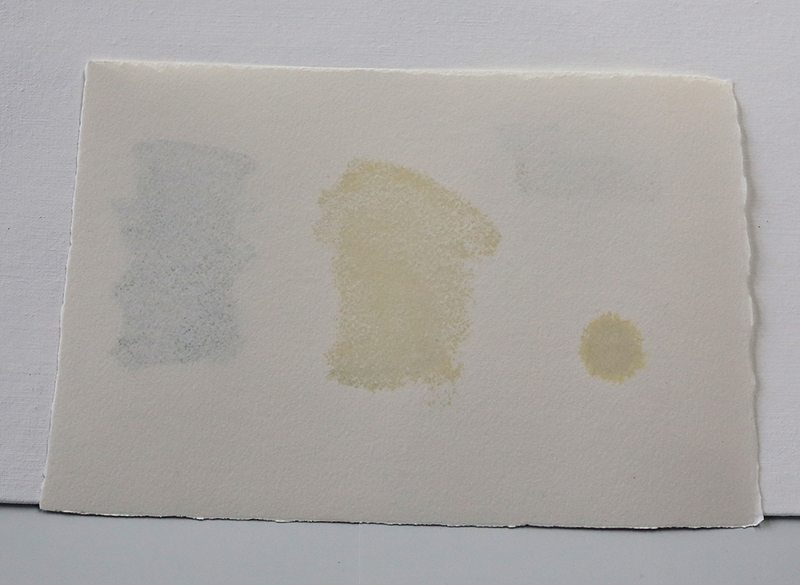 Our intention for this test was to see how the different acrylic products would affect unstretched watercolor paper. That said, your point is a good one. Wetting the paper so that it swells, then taping with a wet adhesive tape or even stapling it to a rigid support while it is still wet can produce a drum tight, flat surface once the paper dries and shrinks back down. We would still recommend several coats of acrylic product to protect the paper from oil penetration. This can be applied to the stretched paper which subsequently will puff up and look distorted, but which should return to a nice, flat surface once the acrylic dries. This stretched and sized / primed paper can then be painted on with oil paints or removed and trimmed for later use. Happy Painting! I was surprised to see you didn’t tape the paper down before priming which is the way I’ve usually seen this practiced, but it makes sense not to if you are going to coat both sides and even out the stress. Can you comment on this? It is great to hear from you. Thank you for your comment! We found that taping the paper down before priming didn’t necessarily stop the paper from buckling. 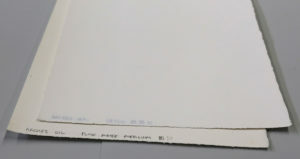 We also wanted to prime all the way to the edge of the paper to get an even tension across the entire surface instead of having a boarder of unprimed paper. For this test, we did not prime the back of the paper. We chose this method simply to see which products caused the least buckling of the surface. We wanted to recommend something that blocked oil penetration, was easy to prepare and cost effective. Priming the back of the paper requires twice as much product and can take twice as much time. That said, we have found that applying acrylic product to the back of the primed watercolor paper can help to even tension and flatten out the paper. The very best case scenario we found, which we did not mention in the article because it was much more involved, was stretching the paper. We did this by soaking the 140# watercolor paper in a bath for up to an hour and then stretched it onto a homasote board when wet. We attached the paper to the board with staples. When the paper dried, it was tight as a drum. It swelled when acrylic product was applied on top, but went back to being very tight when dry. Stretched and primed paper should not swell when oils are applied on top. We hope this is helpful! Ok very interesting, thanks for the feedback and clarification here Greg. Just came across this article! Thank you! I have been painting in oils on Heavy 640 Arches. Some pieces I’ve used a double or triple layer of Luquitex gesso prior to painting in oils. With the heavy paper I don’t have much of a problem with warping. If there is some I spray water on the back and sandwich flat with weights. I’m hoping this process is archival! Thank you for your comment! Three layers of Gesso should be sufficient to block oil penetration. We recommend six months to a year before varnish. Other than that, your process sounds fine. Mounting under glass should help protect from dust and dirt. We wish you well in your studio. Please let us know if you have any other questions or comments. We can be reached by phone at 800-959-6543 or email at help@goldenpaints.com. Great article thank you! I’m curious about what type of varnish you would recommend? I experimented using regular 300g/m cold press watercolor paper primed with a couple coats of acrylic before I used my oils. Surprisingly no buckling or seepage at all. That sounds great! You can use GOLDEN MSA Varnish with UVLS for oil paintings. It does a beautiful job unifying the sheen and providing UV protection. We recommend allowing the painting to cure for 6 months – a year before varnishing. That way, the varnish will be less likely to intermingle with the paint layers and sink in, which can cause variation in the sheen and make varnish removal more challenging in the future. Interesting article. I’ve done a couple oil paintings on Arches Watercolor paper (unprimed). I work with extremely thin layers of oil paint, so I haven’t had any trouble with the paint penetrating through to the back of the paper. I just use a spray varnish (Grumbacher professional quality non-yellowing oil paint varnish) on it once it’s sufficiently dry. As long as I’m not working with really heavy layers of paint, I’m guessing that priming the paper isn’t really that crucial – correct? Thank you for your comment. When painting on an absorbent surface like watercolor paper, it is likely that some oil is being drawn out of your paint layer into the substrate, no matter how thin the layers are. This small amount of oil may not be significant enough to stain the back side of the paper, but may be enough to degrade the paper at the interface where the oil paint is adhering to the surface. Over the long term, this could weaken that interface and result in the paint layer being poorly bound to the paper. Moving forward, we would recommend a sized paper. If you enjoy the visual effect and feel of painting directly onto the raw paper, then an alternative could be a pre-sized paper intended for oil painting, such as Arches Oil. If, on the other hand, you are interested in sizing the watercolor paper yourself, we recommend 2 coats of clear acrylic medium, like Fluid Matte Medium or GAC 100 or 3 coats of Acrylic Gesso to block oil penetration. For the pieces you have already made without sizing, framing or mounting so to keep the paper flat would be preferable. Feel free to call or email if you would like to discuss these options. We hope this information is helpful! Best wishes in the studio.